QPR midfielder Joey Barton has called the Football Association's punishment of John Terry a "shambles". 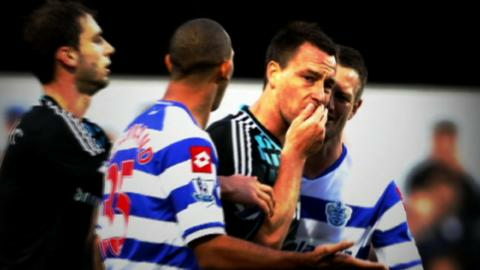 Chelsea captain Terry was given a four-match ban and fined £220,000 for racially abusing QPR's Anton Ferdinand. But Barton says the FA should be "embarrassed", claiming there is a major discrepancy between the 12-match suspension he received for violent conduct and Terry's penalty. "What an absolute farce," tweeted Barton, who is on loan with Marseille. Barton, who played in the Premier League match last October in which Terry abused Ferdinand, was handed his ban following QPR's game at Manchester City on the final day of last season. The midfielder was sent off for an off-the-ball incident with City striker Carlos Tevez before clashing with City players Sergio Aguero and Vincent Kompany as he left the pitch. Barton, 30, said that by the "FA's perverse reckoning" he would have "got less of a ban for racially abusing the Man City players than tickling them like I did". He added: "In what circumstances can that be right?" A number of other high-profile footballers and managers - past and present - have commented on the Terry case, which ended on Thursday following a four-day hearing at Wembley Stadium. Former England captain Gary Lineker also questioned the length of Terry's ban. The ex-striker, who now presents Match of the Day, wrote on Twitter: "The FA find John Terry guilty and give him a four-match ban and 220K fine. Just one game more than a regular red card?" Jose Mourinho, Terry's former manager at Chelsea, insisted the defender is "not a racist". "He's not racist, that's 100%," the Real Madrid coach told CNN. "Probably he had a racist comment or attitude against an opponent. Sometimes in football we do things the wrong way. "If he had that reaction he should pay but please don't say he's a racist." Terry has 14 days to decide whether to appeal against his punishment, which will only come into effect once the outcome of any appeal is known. Former England manager Graham Taylor hopes the 31-year-old centre-half accepts the FA's decision. "Having sat on these panels and made judgements myself, I know those people will have come to their conclusion in an honest and proper manner," said Taylor. "They will have had legal advice. "Whether John and Chelsea accept is it up to them, but I think it might be in everyone's interest to put it to bed." Former FA executive director David Davies believes the case should have been resolved sooner than it has been. "It's gone on far too long. It should never have been allowed to drag on for a year," he told BBC Sport. "I hope lessons have been learned from it, not just by those concerned, but also by the FA." MP Damian Collins says the ban presents Terry with an opportunity to acknowledge what he did was "wrong". "He admitted making the remarks," Collins said. "It is unacceptable for a player to make such remarks, so it was hard for the FA to come to any other decision. "John Terry is still a relatively young man. He's got a chance to move on from this and be a role model again. He has to build his own bridges with black players, who were very upset by what happened." Kick it Out's Lord Ouseley believes the game has to move on now that the case has been concluded. He told BBC Radio 5 live's Richard Bacon: "This is not about recriminations. It's about how football moves forward from here after it has spent 11 months going through the wringer. "People are trying to make the game a better place to be. Seven million people play on a regular basis and we want them to play in an atmosphere of no abuse." Before the hearing began, Terry announced he was quitting international football. The former England captain, who earned 78 caps, claimed the FA's decision to charge him had made his position "untenable".